RECORDING WEEK: These seven priceless nuggets of practical advice should help to make the difference between your next bass recording session being a non-committal exercise in level-setting and one that results in a folder full of properly ear-catching audio that shakes your home studio to its very foundations. That buzz you can hear on your bass recording might initially sound like it adds character, but it'll quickly become annoying. If you're getting noise in your signal when you record, try moving your bass player around, as the likes of monitors, lights, mobile phones and ground loops can all cause it. It sounds obvious, but you'd be amazed at the number of recordings we hear that feature an out-of-tune bassline. There really is no excuse for it, particularly when your DAW will either have a built-in tuner or be capable of hosting a plugin that does the job. It's easy to assume that all bass guitars are born equal, but you'll get a different type of sound depending on the instrument that you're recording. Fender Precision and Rickenbacker 4000 series basses are favoured by rock acts, for example, while the likes of the Fender Jazz and Music Man StingRay tend to be used by pop and funk artists. So, if your player has several different guitars, make sure he or she uses the right one for the job. 4. Which way to play? Similarly, there are several bass-playing techniques, each of which will give you a decidedly different kind of sound. 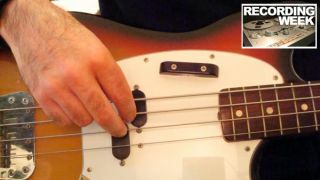 Fingered bass is arguably the most versatile, providing a full, rounded tone, while picked bass has plenty of attack and cuts through the mix. And then, of course, there's slap bass, which, in the wrong hands, can turn out very badly indeed. People frequently ask if it's better to record a clean DI'd output or an amplified one, but the truth is that it's often better to use both signals. If possible, you should keep the two separate at the recording stage so that they can be mixed together later. An alternative option is to record just the DI signal, then feed it into an amp simulator that enables you to blend it with the processed sound, as some of them do. If your bass player is having a few practice runs prior to recording their part for real, why not try surreptitiously hitting the red button and getting these down as well? Some musicians can put too much pressure on themselves when they're 'going for one', and you might find that the loose dummy run ends up sounding better than the 'real' recordings. There are various accepted ways to record a bass amp, but if you want to get creative, try sticking a mic round the back of it as well. This can be used to capture a phase-inverted version of the front mic, and can lead to some very interesting sounds.